It's always sad to see a much-loved Mac start to feel slow and doddery as time goes on, with longer start-up times and more waiting around for things to load. When you see the nippiness of something like the iPad or MacBook Air, it can make you feel as though you want to replace a Mac that should still have plenty of life left in it, really. Fortunately, there's a cheaper way to put some nippiness back in your old machine: swap out its SATA hard drive for a solid-state equivalent. 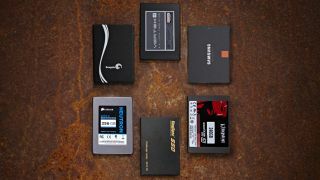 Solid-state drives, or SSDs, ditch the spinning disks of regular hard drives in favour of extremely fast flash storage. Decent-size SSDs are now easy to find for prices that really won't break the bank these days, and that's what we're testing here. If you're uncertain about installing a drive yourself, ask at your local Apple Authorised Service Centre if they can help. Installing an SSD can make older Macs feel like new - or maybe even better! It's not just replacing old drives that SSDs are good for, though - if you've got a Thunderbolt-equipped Mac and want some fast external storage, you can use any one of these drives with a Thunderbolt drive caddy to give yourself some additional external storage that's as fast as an internal SSD. When regular spinning hard drives were the only really viable storage option, the interface used to connect them to the computer didn't have to be that fast. SATA II was what most computers used up until a few years ago, but as SSDs became more popular, it quickly became clear that the SATA II connection was actually acting as a bottleneck for their performance - the drives were faster than the connector was. Newer Macs all use SATA III connectors, which lets SSDs run at their full capability. Because we're interested in these drives as upgrade options for older machines that you want to give a speed boost to, as well as being ways to make a lovely new Mac even faster, we ran two sets of tests. Pretty much any Mac older than 2011 will have SATA II connectivity instead of SATA III, so to make sure that you can see the results for performance in the kind of machine you have, we ran all tests over both connections. First, each drive was connected to a Seagate GoFlex Thunderbolt caddy plugged into a 2012 Mac mini, in order to test their SATA III performance. Once those tests were finished, each drive was used to replace the internal hard drive in a 2009 MacBook Pro 13-inch, which only has a SATA II connector. We ran the exact same set of tests in each case, and the benchmarks on the following pages will show you both the internal and external results for each drive, along with the results from testing the original hard drive in the MacBook Pro, as a baseline. Our test suite of choice was QuickBench on OS X 10.8.3. We cloned the same OS install and other files from one drive to another. QuickBench performs a range of read and write tests using various different file sizes, including small random read and write rests, and larger file read and write tests. We had these tests run for 10 cycles each, and we ran the suite of tests twice for each drive when connected over SATA II and twice connected over SATA III. To put together our benchmark charts, we looked at each drive's results over the two test runs, and selected sets of results that produced the highest average score for that drive. This ensures each drive is represented at its peak performance.